Say hello to Susannah, my latest quilt block from issue 15 ‘Art of Quilting’. She looked to be a little complicated from the instructions but as with most things it made sense when the pieces were cut and under the foot! This was another opportunity to practice those set-in seams. 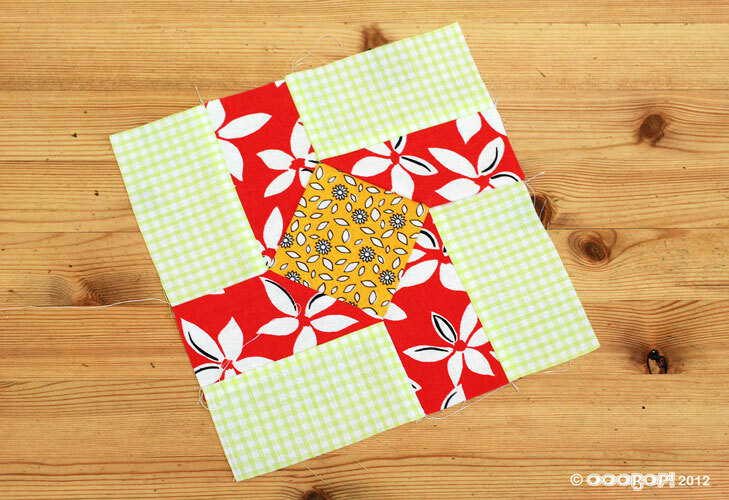 To begin with, the green gingham rectangles and the red floral tapered rectangles were joined in pairs to make the four double patches that occupy the corners. The first double patch was sewn to one side of the orange central square. Then the next double patch is sewn to the first, and again to the central square. Before sewing I marked the 6mm seam line on the wrong side of the central square to ensure that the set in seams started and finished from the point of seamlines crossing and not the edge of the fabric like the other seams. All went swimmingly until the last and final seam, which simply didn’t match up. Took me a while to figure but it was easily resolved by unpicking a couple of stitches and restitching to fit. I’d over stepped the corner seam and it had thrown out the position of the last piece! This seemed like such an easy one from the start, and it is, really, but a lot of care is needed to make it work accurately. History: This is a variation of a block known as ‘Oh Susannah’, the popular song which was first published in America in 1848.
ah, I thought those rectangles were yellow gingham! (It’s OK, I suffer from acritochromacy plus – I hope, I think – that’s a fairly pale green?) I love the look of the block, though. nah, I’m just showing off – my son and I both have this condition but saying” colour blind” is such a bore!! Next PostNext Vintage pattern treat time!